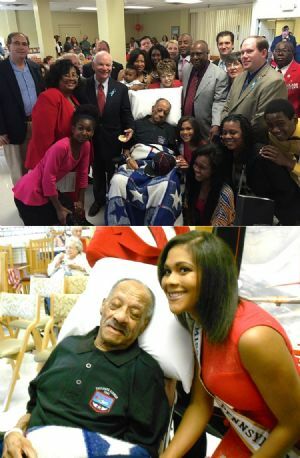 As detailed in the article below, on May 15, 2015 Flight Officer William Augustus Colbert, Jr. was awarded the Tuskegee Airmen Congressional Gold Medal. Along with the photograph of the presentation which appeared in the newspaper, we have placed a photograph of Mr. Colbert with his great-grand-daughter, Aynia Dorsey, Miss Black Pennsylvania US Ambassador, who took part in the ceremony. CUMBERLAND — Member of the famed Tuskegee Airman and World War II veteran William A. Colbert Jr. was given a Congressional Gold Medal by U.S. Sen. Ben Cardin on Friday at the Allegany County Nursing Home. Colbert, 95, of Cumberland was unable to attend, due to poor health, a 2007 awards ceremony in Washington, D.C., where more than 300 of his fellow “Red Tails” were honored. Friday’s event was hosted by Al Feldstein, a local historian and member of the board of trustees for the Maryland Historical Trust. Feldstein said he first met Colbert at the former Fulton-Myers American Legion in 2004 where Colbert was giving a lecture on the history of the Tuskegee Airmen. “I was impressed then by this character, humility and courage on the personnel and military, and I am still impressed today. It is an honor and privilege to be a part of this day,” said Feldstein. Numerous members of Colbert’s family, including a 10-month-old great-great-grandson, were in attendance. Among the dignitaries present were Sen. George Edwards, Dels. Wendell Beitzel and Mike McKay, County Commissioner Bill Valentine, Julianna Albowicz of Sen. Barbara Mikulski’s office, Cumberland Mayor Brian Grim, Sonny Holding of Rep. John Delaney’s office and Robin Summerfield, field representative for Cardin. Several representatives from various local military posts and legions also attended. “It’s is because of Pap Pap that I have confidence in my ability to do all things,” said Aynia Dorsey, Colbert’s great-granddaughter and the current Miss Black Pennsylvania. According to the Congressional Record, Colbert enlisted in the Army Air Force in 1943 and achieved the rank of flight officer at the Tuskegee Army Airfield in Macon County, Alabama. “We are all here with a true American hero,” said Cardin. Colbert received numerous plaques, citations and accolades from the officials present. Cardin presented the Congressional Gold Medal, the most prestigious award Congress can give to civilians. “This is the 70th anniversary of the end of World War II. None of us know what Mr. Colbert went through. Going to segregated schools, having to go through the indignation of segregation and serving in our military. This country was not fair to him and yet he stepped forward, understanding how important this county was to his children and grandchildren’s future,” said Cardin. Retired Lt. Col. William Burrell, president of the Tidewater Chapter of the Tuskegee Airman, spoke about the discrimination faced by Colbert’s generation. “He had to fight two wars,” said Burrell. Cardin said Colbert, like many of the World War II generation, made selfless decisions. “He fought for this nation and did what was right, and as a result, this country is better today,” said Cardin. Tuskegee Airman were often utilized as escorts on bombing raids. They flew P-40, P-51 Mustang and B-25 model aircraft. The airman were called “Red Tails” because the tailpiece section of their planes was painted red. Colbert was born in Anne Arundel County. Following the war he met his wife, the late Vivian Lee Colbert of Cumberland, and moved to the Queen City. He worked at the Kelly-Springfield Tire Company for 33 years before retiring. On May 21, 2016 William Colbert was posthumously honored with a Lifetime Achievement Award by the Allegany County, Maryland NAACP Branch 7007. The following excerpt is from a biography which appeared in the ceremony program. It focus upon his service and leadership in the community: "Mr. Colbert took a very active role in the local African-American community. As a member of the Fulton Myers Post No. 153, Mr. Colbert served on the Americanism Committee of the Mountain District American Legion in 1946, the only African American serving on the district level. In 1949 he was part of a group of African American citizens who organized a playground association to oversee both the Carver recreational activities and the Pine Avenue Playground activities. Amongst his roles in the 1950s were the director of social action and world service of the Young Adult Fellowship of the McKendree Methodist Church, financial secretary and Esteemed Leading Knight of Fort Cumberland Lodge 176, IBPOE of W., and the chairman of the NAACP Labor and Industry Committee. He frequently hosted community activities and judged local contests, principally in the Pine Avenue Playground Association. In the 1960s and beyond, Mr. Colbert and his wife, Vivian, frequently hosted association meetings in their home, conveniently located across the street from the playground. For many of those years, Mr. Colbert served as the president of the association. As much as Mr. Colbert deserved the recognition of his country for his heroism, he deserves the recognition of his community for his stewardship." Sources: Newspaper article from the Cumberland Times-News, May 16, 2015. Newspaper story by Greg Larry. Newspaper photograph by Steve Bittner. Photograph of Mr. Colbert and great-grand-daughter by Albert L. Feldstein. Note material from NAACP. Mr. Colbert was born in 1920 and passed away on June 1, 2015. His obituary can be seen elsewhere on this website.